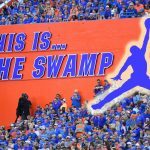 Celebrating the 100th year of Florida Gators basketball, it was announced Monday that the Gators will wear some sharp throwback uniforms to honor the first Final Four team in program history on the 25th anniversary of its run. That 1994 squad, a No. 3 seed coached by Lon Kruger, upset No. 2 UConn in the Sweet 16 before eventually falling to No. 2 Duke in the national semifinals. It finished 29-8 on the season. And while there are few who believe Florida has any chance of replicating that success this season, the team will at least dress like those former Gators for one game when they don the 1993-94 uniforms on Saturday, Feb. 23 against Missouri. In more good news for Florida fans, you can also purchase a replica of this jersey — as well as a T-shirt version. Just hit the links below to purchase and support OnlyGators.com.